If motion does not cease and the continuum of change forever pursues its cosmic and metacosmic oscillations, can we conceive of an end or a beginning to the hierarchy of wholes � of an absolutely greatest and smallest whole? Indeed we seem compelled to say that the hierarchical series extends ad infinitum in both directions. Yet we are faced with a question which cannot be evaded: Has the word infinity � so easy to pronounce! � any valid, understandable, real meaning? As I conclude this book, these questions, already discussed, once more take hold of the consciousness, clamoring for answers. But how can answers be formulated except in words which would be but symbols, as indefinite as Wholeness is indefinable? Yet Man's supreme destiny is to express in symbols what his "walking on" from fulfillment to ever greater plenitude of being can never totally reveal, because "that" has no form, yet is implied in all perfect forms. No mind can ever ascertain the meaning of infinity � or of similarly negative terms as timeless and changeless � because what actually is at stake is the validity of the quantitative mind whose nature compels it to deal with numbers, thus with multiplicity, though unity is implied as its polar opposite in an unending relationship. Nevertheless the human mind has thought of a concept which seemingly eludes the antiphony of the One and the Many. "Number one" can be considered both the first number and the principle of numeration; every subsequent number is produced by the addition of one to itself. The series seems to have no possible end, as no number can ever be the largest possible. But this is not all: the intellectual mind also has imagined a series of equally endless negative numbers, which is the inverted image, as it were, of the positive series. What, then, of the zero that stands between the positive and negative series? Zero may be called "no-number," but has this negation any real meaning? Mathematicians also use the symbols of plus and minus infinity. These, too, are "no-numbers"; they do not refer to quantity. To what could they refer, together with zero, if not to the experience of Wholeness, for Wholeness cannot be understood, much less experienced, in quantitative terms? Zero and plus and minus infinity are symbols of the realization of Wholeness by the whole that has become conscious of the choice it can make between affirmation and negation. Such a whole is Man. The true symbol of conscious Man is zero � a symbol whose form signifies the elliptical orbit of a planet. An ellipse does not have one center but two foci. Similarly, the Movement of Wholeness results from the tension between two complementary forces of opposite polarities. Man stands in the midst of the duality and is fulfilled in Illumination at the symbolic Sunset, when the two great forces of being reach a state of equilibrium which, in terms of the rise of an ever more integrated consciousness of being, polarizes the Sunrise moment of divine-cosmic Creation � the perfect Act in which Unity and Multiplicity are also balanced. Illumined Man stands at the midpoint, way between the size of the largest cosmic whole and that of the most minuscule subatomic particle our instruments can reveal. Most significantly, as the scientist's vision reaches meta-galactic fields of existence at practically the same time it gains the ability to perceive the smallest molecules and to identify the paths taken by disintegrating atoms. The evolution of human capacities of perception is one movement of consciousness in two directions: zero reaching toward plus and minus infinity. Any whole is finite, for it belongs to the realm of quantity, the realm of number. The more it belongs to the half-cycle of existence dominated by the principle of Multiplicity, the more it can be objectively represented by a particular number. Yet a moment may come when the consciousness in finite wholes becomes aware of Wholeness. As the mind reacts to the experience, the person can only think of it as infinite. He or she wants it to be infinite, for one finds exaltation and ecstasy in the denial of all limitations and in the ability to conceive or envision infinity. Indeed, the more constricted by finite boundaries the consciousness had felt itself to be, the more intense the ecstasy. But the fully mature consciousness in the state of illumined equilibrium realizes that infinity is as much a lure and an illusion as the finite structure of a particular whole of being is a prison. Reality is in the movement that leads from lesser to greater wholes. It is an ever-repeated rite of passage. Whoever seeks to perform it successfully should invoke the "blessing" of Wholeness upon his or her movement, which should be a movement attuned to the rhythm of Wholeness � a movement sub specie aeternitatis. It should be Wholeness in act � a totally conscious act, because consciousness inheres in Wholeness. The question raised by the logical impossibility of attributing an end to the hierarchical series of wholes is therefore self-defeating, for when posed in such quantitative and dimensional terms it reveals a consciousness bound to a particular set of personal-intellectual limitations. It reveals a mind that has become identified with a particular number. Wholeness cannot be understood, and even less experienced, in quantitative terms. Any number in search of a "Father" should go back to the One-in-the-beginning, but the realization of Wholeness can arise only in the consciousness which has accepted becoming the no-number, zero. In this metaphysical and symbolic sense, in zero only can there be Wholeness. In zero the concept of and the longing for infinity becomes meaningless. Zero can be added to any number; the "presence" of Wholeness illumines any whole that can be inspired by it to take one step forward in the hierarchical series of wholes. In order to "walk on" the "I" must be ready to experience the fall into zero and then to pass on. At each step, the horizon of Wholeness seems to increase, but Wholeness must remain indefinite because essentially indefinable. It is indefinable because it can be anything, yet is nothing in particular. 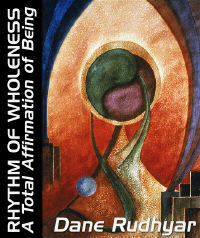 Any attempt to define Wholeness merely defines the position of the definer in the Movement of Wholeness. Yet, recognized or not, Wholeness is everywhere and at all times "present" in every whole. It gives power to every act of relatedness open to the realization of Its presence � a dynamic presence, for It is unceasing motion. And in the Movement of Wholeness all there is, was, and ever will be is inter-related and interacting.